Seven year have almost pasted by and yet it feels like none have. Every time I whisper to myself "I'm married", it strikes me down on my knees it's been a while. It still feels as if the love is fresh like a dasiy or the sweet gentle smell of laundry on a warm spring's day. "I'm in love" I tell the winds every day. Now what i don't get and what I really hate to think of is Divorce. Some couples feel the blade of divorce a long way into their marriages and some aren't so fortunate, they feel it way before they have even become wed.
Now those that feel the shape and corruptive blade of divorce before they've wed, before you've wed. I need to ask one question. "Why did you let it get so far to even say YES?". So glad I own all mine! Things are different, in different lives, in different minds and souls, and in different backgrounds, but to live in hell, in what it may seem like to be laying in bed with someone you truley dont love any more. Must have some effect on you mentally. Or if it is not you not, not in love, but your spouse, did you not see the signs? What are the signs? Could someone tell me? So that if I dwel in a spell of time and confusion I will know what to do to stop the pollution in my marriage. 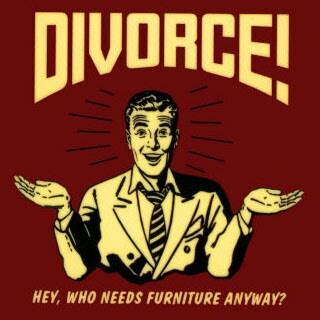 Just had a thought in order for there to be any divorce some one has to make their mind up. It's not something you would JUST do. I can not wait for the day to be the day that i stand up tall and say they we have been togther for 10 years to the day on that wonderous day. Not that I expect to only bee married for 10 years but that is a long time to be married in my eyes. And in the eyes of mine I mean I've only known one truely married couple, the others just seem to be together and bare no rings. Not that no rings means, no marriage but hey I'm allowed to assume like the best of us do. Have the married in "air quotes" people I know (that dont have rings or papers) act as if they hate each other. I never see them laugh, or touch or anything. It always seem it's a hassle for them. Well to get of this depressing subject I'm going to do something for my loved one, that they will not expect from me today.